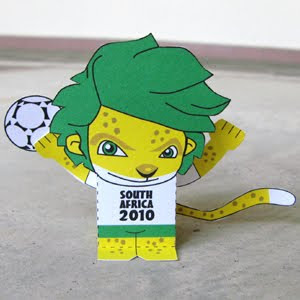 This mascot papercraft is the Zakumi, the mascot of the 2010 FIFA World Cup. The paper toy is designed by Toy a Day. Zakumi the Leopard was the Official Mascot for the 2010 FIFA World Cup. He is a cheerful and sporty leopard with green hair, presented on 22 September 2008. His name comes from “ZA”, the ISO 3166-1 alpha-2 code for South Africa, and “kumi”, a word that means ten in several African languages, referencing the year 2010.